How can this be the work of a beginner? We have a post a day early this week because I have to work all day tomorrow in the Trauma operating theatre and won’t have time to write anything for you. Luckily the present Mrs S knows how important my blog is to me (and hopefully to you) so she has allowed me time on Saturday away from DIY etc to produce a review of something very special. I do tend to consider myself very lucky. I have a very tolerant wife who puts up with this truly ridiculous hobby of mine with only the occasional Whack! Ouch! 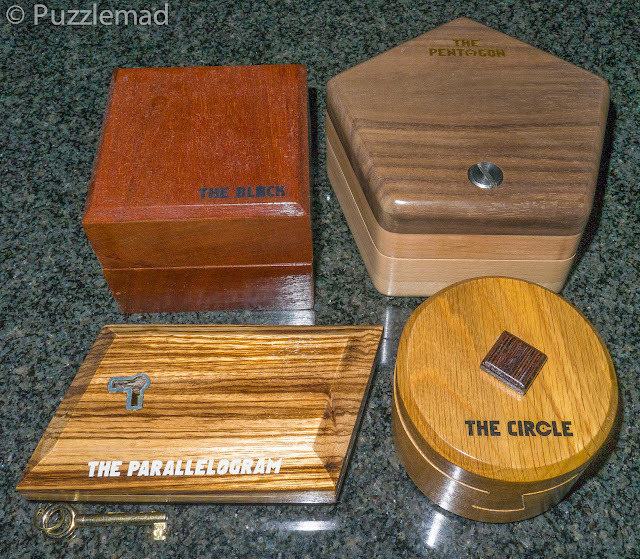 I have great friends in the puzzling community who are happy to discuss my obsession with me and share their thoughts and even let me play with their new toys and I even have the great good fortune to be in contact with (and even be great friends with) some fantastic puzzle designers like Shane, Wil, Steve, Stephan and Alfons. She won't let it be on display! 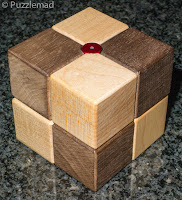 One of my greatest puzzle friendships has been with Shane, who initially contacted me to discuss the blog, collecting and solving puzzles and over a period I discovered that he was a Master woodworker (with a certificate too!) and I sort of encouraged him to turn some of his ideas into a real puzzle. It started slowly but Hales Puzzles was established and his work is now highly sought after. In fact, his work now stands on display on the sideboard of my dining room with huge pride (although that hideous dirty case from the Pentagon has been put in the loft on pains of another Whack Ouch!). I have always hoped that someone else would do what Shane has done so generously but because puzzle design and production is so difficult, it could not happen frequently. 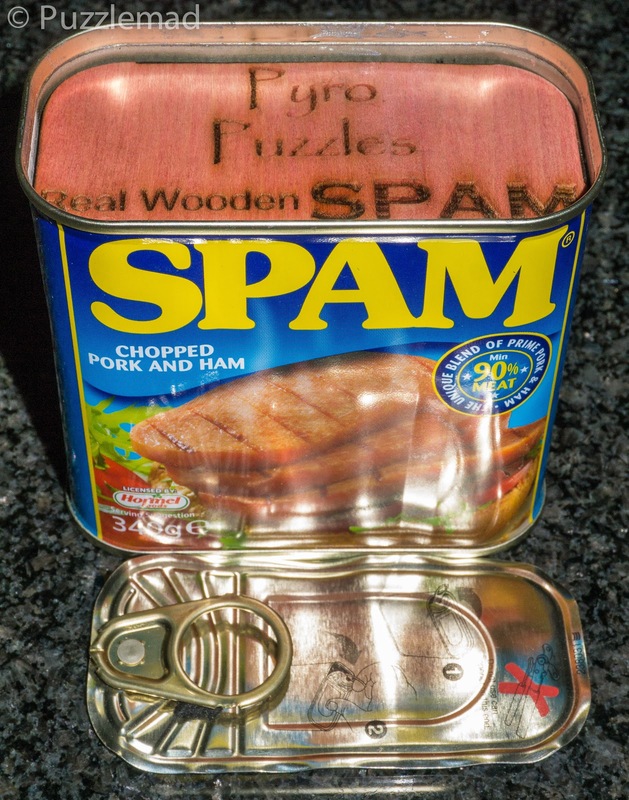 Steve Miller sent me his Spam puzzle last week and I investigated it with trepidation - it had a curious smell of burnt wood which luckily was not from some explosive that he had set up but actually came from laser cut and engraved wood. 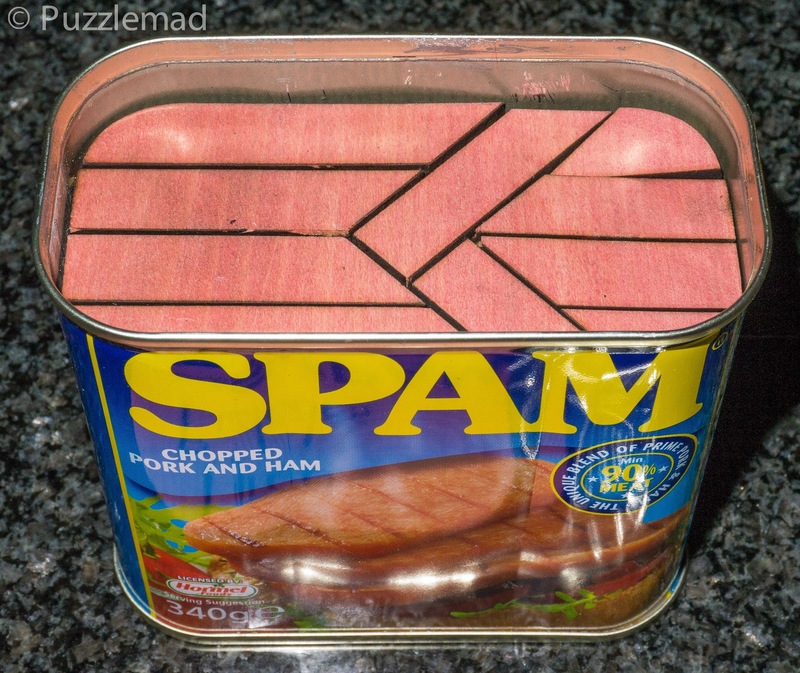 The Spam puzzle will prove to me an absolutely horrific challenge for even the most ardent of packing puzzle fans - thank heavens I didn't just up-end the tin and shake it all out. It would probably be a pile of sticks forever more. I think even Dave Holt (THE metagrobologist) who adores packing puzzles might even be stumped by it! Now imagine upending a tin containing 15 layers! 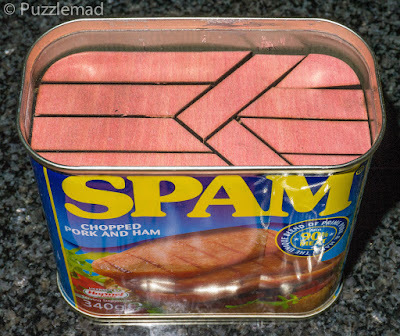 Each with a different way of dissecting a slice of "spam" up into many pieces with many different orientations and shapes, some of which are very small! Yet again, thank heavens I didn't up-end the tin! Phew! Have a look at my New Additions page to get a view of true horror! Earlier this year I was contacted by a new designer called Carsten Elsäßer from Germany who wanted to gift me a new design of his so that I could play with it and review it for him. At that time I had no real expectations of quality from him and was absolutely amazed when the Two Piece Cube arrived. Not only was it simply gorgeous, but it turned out to be a really clever puzzle with a nice Aha! moment. Then, when it came to the second and third challenges it revealed itself to be a truly elegant idea. I took this to the last Midlands Puzzle Party and a few people attempted it. What amazed me most was when the Puzzle solving machine that is Louis Coolen sat down and played with it. Of course he solved it! But he had a big smile on his face when he realised the nuances of what is required. Approval from Louis is a VERY big thing - he really appreciates elegance. Last week I was contacted out of the blue by Carsten again. He told me that his favourite type of puzzle is the sequential discovery puzzle and he had been beavering away in his shed to produce one of his own. Again, he said that he had no idea whether it was any good and he wanted me to play and review it for him (and if possible to get opinions from other puzzlers too). Of course I jumped at the chance! Recently I have been rather preoccupied with my concerns relating to my mother’s rather serious illness and have barely done any puzzling at all. I have been spending my time trying to get copies of her scans sent to my hospital so that I and my medical consultant friends in Sheffield could review them as well as trying to optimise her pain relief. I actually forgot that Carsten had sent anything! A week later postie rang the door wanting my signature for a package and the first thing I noticed and pointed out to postie was OMG! That’s really heavy! After an excited unboxing and being given yet another Whack! Ouch! 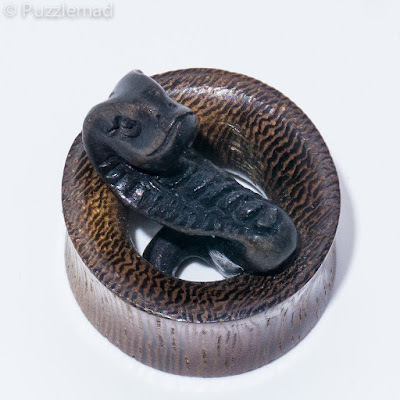 for getting the packing material all over the newly cleaned kitchen (he had used the results of a cross-cut shredder to pack the puzzle tightly), the Naga puzzle was revealed as you see at the top of the post. It weighs just over 1.2Kg (that’s 2.65 lb to you Yanks) and to my huge surprise is made mostly from brass! How does an amateur puzzle designer manage to produce something so perfect in his shed? This is even more amazing than Shane’s production - Shane is a fully trained Master craftsman and has the ethos that what he produces should be beautiful. It would appear that Carsten is a lighting engineer on a cruise ship and spends 9 months of the year away from home. During this time he thinks up his ideas, jots them down and then develops the ideas to produce the finished product on paper before he can produce anything. During his 3 months at home he retreats to his shed and uses the tools that his father has accumulated over a lifetime of collecting. Working in metal is HARD (I know this from my chats with Shane who manages to include pieces from various material types in his puzzles) and yet Carsten has produced something truly beautiful. “Nagas were part of most asian religions. Especially in the eastern parts of Indonesia - many people had wooden snakes in their homes which granted them protection, health and fortune. 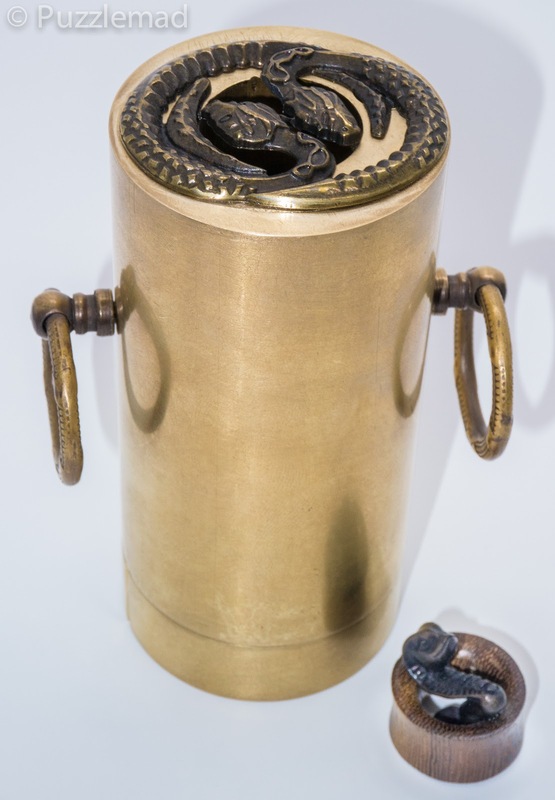 During the beginning of the 20th century the christianization began and the missionaries burned all the wooden snakes they could find to display the impuissance of their guardian spirit against the one god. Only a few people were able to hide their families Nagas. Before I began work on this and immediately after I unpacked it, Mrs S picked it up went wide-eyed at the weight and metallic nature of it and told me in no uncertain terms that it had to be removed from the kitchen/family room/conservatory area. N eedless to say I RAN into the living room with it and sat down to play surrounded by a carpeted floor and soft furnishings. I suspect that a Whack! Ouch! at that point might have used the puzzle as a weapon and would almost certainly have been fatal! As you can see there are a number of parts to explore initially. The screw on the front is very tightly turned and definitely not going to unscrew without a tool. Nothing is loose or comes off so I did the obvious. No I’m not going to tell you what - use your imagination! The first tool is now available and it provides the first real aha! moment. The next step seems to begin but it won't complete - and I was stumped. I recalled that my instructions from Carsten was that there is NO spinning, no force, no banging at all required. I did hope to God that there was no submerging in water or gin required as that would require me to take it away from soft furnishings which was VERBOTEN by the present Mrs S. After about 10 minutes of trying the same thing in various directions, I concluded that I was missing something. The search began and after a few minutes I found another rather awkward to use tool and put it to work. I soon realised that I had to use the two tools simultaneously which is no mean feat for a man with my limited dexterity skills. Suddenly something very heavy dropped in my lap (luckily not doing any damage requiring the skills of my friend Steve Canfield). I can see the Naga! I have a brass ball too! There was something inside the puzzle - there is a ball and you can see the Naga held in place by that screw. Obviously the ball is the key to the next step and there are some very interesting features to it. I imagined all sorts of ways that I might open that ball and not a single one of them worked! After about 20 minutes I had to try my other tools to see if they would help and even after that I got nowhere…. until Bingo! I found something new. In a hurry I used that new thing expecting a great result but nothing happened. The ball remained firmly closed and I had absolutely no idea why. It was time to do Allard’s copyrighted activity and THINK! Using yet another tool in a really ingenious way finally let me open the ball. 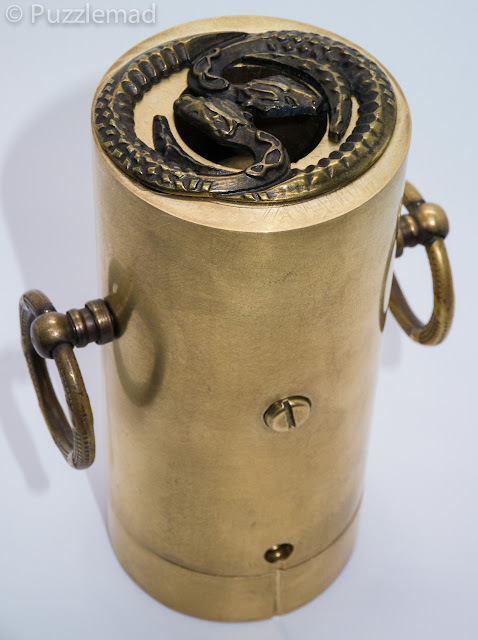 After that I had several more small pieces of metal and was able to free my Naga to gain protection over my household - I'm not sure it will protect me from the violence of she who already lives inside. Whack! Ouch! Sorry dear! After that step yet another tool was provided before the Naga was finally released from its captor. Hopefully it will bring luck and protection to my household. I suspect this is a genuine Indonesian piece! Carsten wanted to know what I thought of his design and I think you know the answer. This is a truly fun and beautifully made sequential discovery puzzle - it is getting up to the standard of those produced by the equally amazing master of this puzzle group, Brian Young aka MrPuzzle LINK. 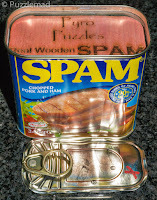 Brian is internationally renowned for these puzzles and also uses a combination of wood and metal. For an amateur puzzle designer and craftsman, this is a truly amazing feat. There are multiple steps, some of which are really quite tough to discover and never any requirement to use any force or suspect moves. It has a beautiful story (a great feature of Shane’s puzzles) and the sequence is quite logical but still requiring some lateral thinking. I know this will have been very tough to make and probably impossible to produce in any bulk but they would certainly sell like hot cakes. I plan to send this to Allard initially so that he can spread it amongst the various MPP guys (Chris, Oli, Ali etc). I would appreciate it if each of you who works on it can send me your opinion for me to pass on to Carsten (and also add to my blog). After the MPP guys have received it then I would ask Allard to send it to Steve before he sends it on to Shane to play with before he then returns it to me. I will bring it with me to other puzzle parties for folks from further afield to play with. Whatever you do - DO NOT open this puzzle over anything fragile and DO NOT open it over anywhere that you could lose small parts - the pieces inside are truly tiny and easily lost. Please do it over a tray covered with a white cloth/towel to ensure that you can see all the tiny parts when they drop out. Some are literally only a few mm in size. Thank you Carsten, you have really cheered me up after all the worries I have had recently with my mother’s health. Hopefully you will produce even more amazing puzzles in the future. I look forward to sending you regular updates from the MPP crowd. 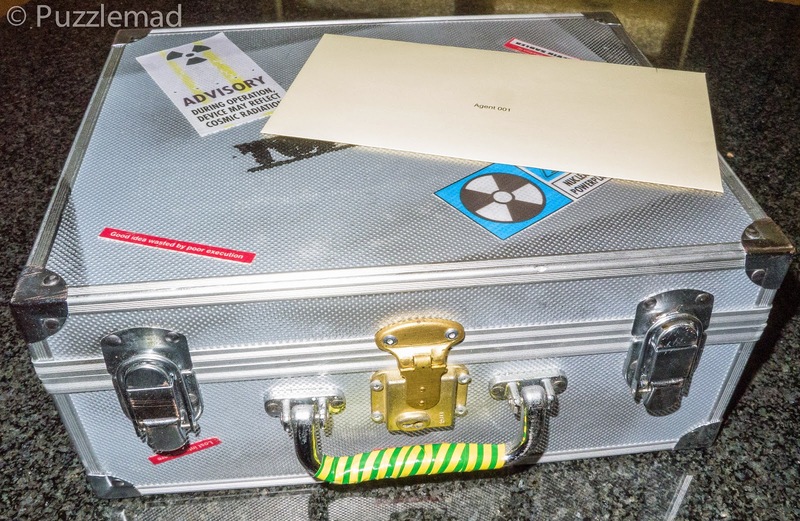 This is the best present to a hardworking puzzle blogger like you. I hope your mother will get well soon. Thanks so much Otis! It is quite hard work keeping a regular blog going especially as I seem to specialise in long form detailed articles! Luckily Mrs S is actually quite tolerant of the time I spend on it. Thanks for the good wishes to my mum - hopefully soon we'll have an answer and treatment. Kevin, thanks again for sharing this unique puzzle with the world. Your description brings it alive for us who may not ever get to solve it! Carsten should be congratulated and begged for more copies! I'm also glad you did no permanent damage to your sensitive parts, but it appears Carsten was thoughtful and provided a brass ball replacement just in case his puzzle had some collateral damage. Let me know if anyone needs my help implanting that for them in the future. Simply brilliant retort Steve!!! Had me giggling in my seat! One day you and I need to share a cocktail and talk puzzles and operations (mostly puzzles)! Nice write up Kevin. 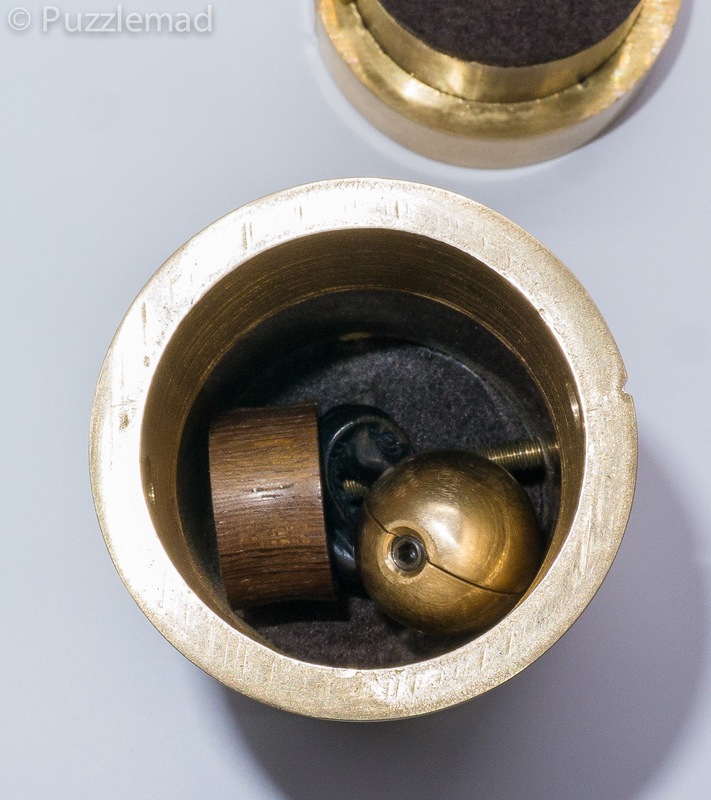 Wow, this is a really cool sequential discovery puzzle from Carsten, incredible work!...I really love the way its been made out of brass! Wish I can have a go at it someday. Mike, are you in the UK? Do you go to Midlands puzzle parties? If the answer to these are no then all I can say is if you are EVER in the vicinity then let me know and we could meet up for a puzzle party of our own and I'd be delighted to bring any of my toys along for you to play with! Who knows maybe the first Yorkshire puzzle party could be born! Thanks Kevin, a very generous offer and if i am ever in your neighborhood i will surely take you up on it. However, as it stands i am (unfortunately?) in Hawaii and remain a half a world away. But i do travel occasionally for work (usually west though), so there is some hope. MPP crowd sounds like a great bunch.